WASHINGTON --- The State Department has made a determination approving a possible Foreign Military Sale to the Government of Greece for an upgrade of F-16 aircraft to an F-16 Block V configuration. The estimated cost is $2.404 billion. The Defense Security Cooperation Agency delivered the required certification notifying Congress of this possible sale on October 16, 2017. The Government of Greece has requested a possible purchase of an upgrade of its existing F-16 fleet to an F-16 Block V configuration which includes up to one hundred twenty-five (125) APG-83 Active Electronically Scanned Array (AESA) Radars (includes two (2) spares); one hundred twenty-three (123) Modular Mission Computers (MMCs); one hundred twenty-three (123) LINK-16 Multifunctional Information Distribution System Joint Tactical Radio Systems (MIDS-JTRS) with TACAN and EHSI; one hundred twenty-three (123) LN260 Embedded Global Navigation Systems (EGI)/Inertial Navigation Systems (INS); and one hundred twenty-three (123) Improved Programmable Display Generators (iPDGs). Also included in the proposed sale are up to one hundred twenty-three (123) APX-126 Advanced Identification Friend or Foe (AIFF) Combined Interrogator Transponders (CIT); one (1) Joint Mission Planning System (JMPS); one (1) F-16V Simulator; upgrade to two (2) existing simulators; one (1) Avionics Level Test Station; Secure Communications, cryptographic equipment and navigation equipment; upgrade and integration of the Advanced Self-Protection Integrated Suite (ASPIS) I to ASPIS II on twenty-six (26) F-16s; Ground Support System, systems integration and test; spares and repair parts, support and test equipment; personnel training and training equipment; publications and technical documentation; U.S. Government and contractor engineering, logistical, and technical support services; and other related elements of logistics and program support. The total estimated program cost is $2.404 billion. 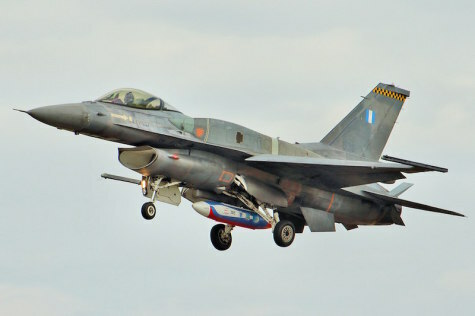 The conservative opposition on Wednesday urged the left-led government to provide more information about a reported deal to upgrade the F-16 aircraft in Greece’s Air Force. Reports put the deal – made public during Prime Minister Alexis Tsipras’s official trip to the United States – at 2.4 billion dollars, although Defense Minister Panos Kammenos later said the price tag will be lower. In a statement on Wednesday, New Democracy’s shadow defense minister Vassilis Kikilias said that “upgrading the operational capability of Greece’s F-16 fighter jets is an imperative,” adding however that contradictory remarks by government officials over the agreement suggested that the administration had approached the matter in a haphazard manner. “The government must as soon as possible inform Parliament on all aspects of the deal as the cost of upgrading the aircraft appears to be exorbitant,” Kikilias said.